Today I wanted to speak about happiness and ignoring expectations. Sometimes we feel like we have to live up to society's expectations when it comes to different aspects of our lives. Whether this makes us happy or upset, we still do it because we feel like we have too. 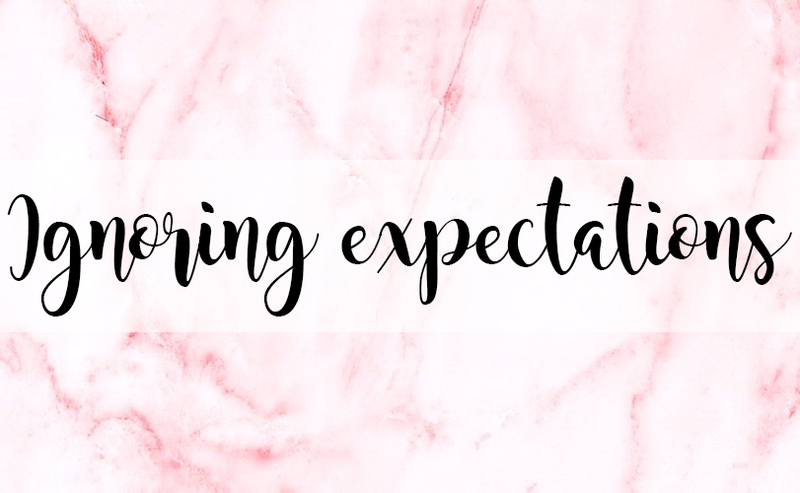 However, there are people who basically stick their middle finger up to these expectations and live their life the way they want too (this is definitely something I would like to start doing). I want to hand you the choice to let go of these habits and to ignore any expectations which people put on you; whether this is through your blog, in your job or even in education. There will always be those people around you who have their opinions on what you decide in your life and how you should handle everything that life throws at you. No matter what the situation is, they feel their opinion matters. However, there's no point paying attention to these people. You need to make decisions based on what you think will give you the biggest chance of happiness and success. You know what it's going to take for you to get to that place, no one else. So why listen to their opinions when they do not make a difference to your overall outcome? Many people also have their own fears, doubts and insecurities within them and these may be big or small but everyone has them. Although, you can choose to embrace these challenges as opportunities to learn within your life instead of running away from them because they're outside of your comfort zone. People expect you to run away and hide from these challenges because they know it's sensitive to you but ignore these expectations. Ignore the fear, or embrace it. If someone expects you to run away, use this as momentum to overcome the challenge to prove them wrong. You will learn and grow and that's what is most important. It's incredible to look up to someone for inspiration, for someone to be a role model to show you from right and wrong. But do not make this person make you feel small or insignificant as you're not, not at all. Your journey to where you are today is unique and it happened for a reason. You are you for a reason and you do not live up to expectations so you can be different. Continue to focus on yourself and how you are growing as an individual in this world and do not let anyone get in the way of this. No one else can be you and you cannot be anyone else, so learn to love that. Do you run away from challenges or face them?